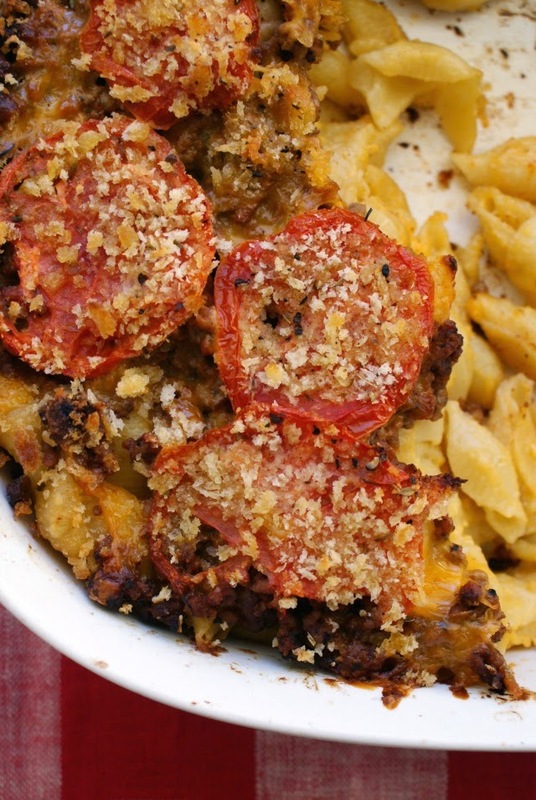 Cheeseburger Mac and Cheese is a cheesy and filling casserole that is a mash up of two all-American favorites: the cheeseburger and baked macaroni and cheese. I get a lot of magazines in the mail and they're one of my favorite places to get recipe inspiration. Honestly, I wasn't so sure about this recipe when I first saw it in Family Circle. I kind of think macaroni and cheese is one of the greatest things on earth, so the idea of messing with classic cheesy mac and cheese is a bit unsettling to me. Getting too crazy with add-ins and toppers is like messing with perfection, know what I mean? I decided I'd try this version though, more for my husband than anyone else in the family. The kids and I like my Momma's Baked Mac & Cheese. And sometimes when I'm feeling like a super creamy version, I'll make this recipe. But the hubs is a meat and potato man and would prefer a carnivorous meal as opposed to the vegetarian route. So I'd thought I'd give it a go for him. I do have to admit, though, that I liked the idea of the tomatoes on top. One of my favorite parts of making my Mom's version of macaroni and cheese is the stewed tomatoes we serve it with, and my favorite part of burger night is the Burger Tomatoes I put on my burger. I was pleasantly surprised that the whole thing came together really well. Classic burger meets classic macaroni and cheese. While I still think traditional is best, I'll totally be mixing it up with this version again. We all loved it and my honey went back for seconds! Preheat your oven to 375 degrees. Grease an oval 2 1/2 quart glass baking dish. Boil the pasta according to the package directions. Drain. Meanwhile, brown the ground beef in a skillet over medium-high heat. Drain the grease. Season the beef with salt and pepper. Remove from the heat and stir in the ketchup and mustard. Transfer to a bowl. Return the skillet to the heat and add the butter. Once melted, whisk in the flour. Slowly add the milk, whisking constantly. Bring to a simmer and cook for 2 minutes. Remove from the heat and season with salt. Stir in 2 cups of the cheese. Add the pasta to the cheese sauce and pour into the prepared casserole dish. Top the mac and cheese with the meat mixture, the remaining 1 cup of cheese, the sliced tomatoes, and then the panko breadcrumbs. Drizzle the top of the casserole with olive oil and then sprinkle with a little dried oregano, garlic powder, salt and pepper. 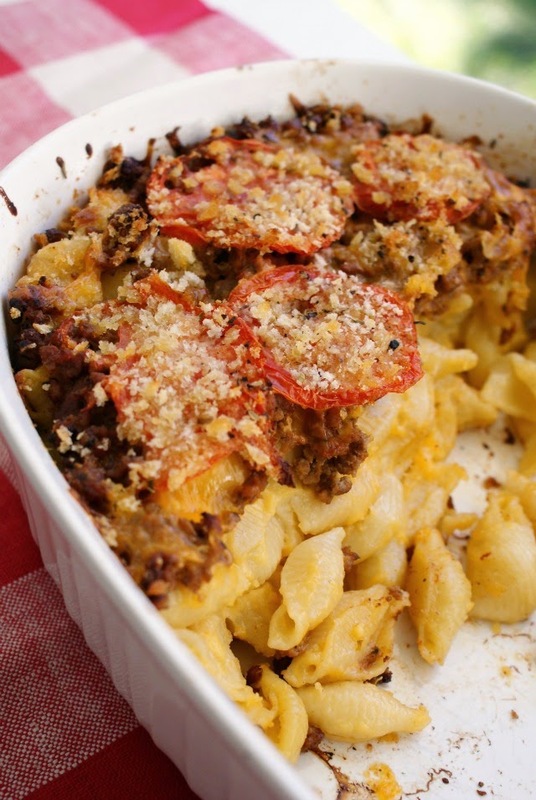 Source: Adapted from Cheeseburger Mac & Cheese in Family Circle Magazine. Cheese is making a comeback on the dining scene. There is a rising trend to serve gourmet cheeses as a separate exciting course.